What do an Amur tiger, a lined seahorse, and a Nun´s orchid have in common? They´re among the rare and fascinating flora and fauna that you´ll encounter at the Indianapolis Zoo and White River Gardens, the nation´s first and only facility to gain threefold accreditation as a zoo, aquarium and botanical garden. Located on the grounds of the beautiful White River Garden and State Park, the Indianapolis Zoo is home to hundreds of species of animals and nearly 2,000 varieties of plants. 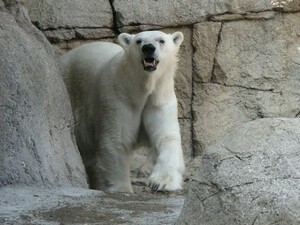 Special events abound at the Indianapolis Zoo. Summer months feature the always popular Butterflies exhibit in the Hilbert Conservatory as well as a summer concert series. Even the winter months are full of fun. Be sure to visit the zoo during the holiday season to take in a holiday-themed dolphin act, enjoy spectacular light displays and maybe even catch a glimpse of Santa. While you´re downtown, be sure to check out other nearby Indianapolis attractions, including the Indiana State Museum, the Indianapolis Museum for Children (it's the nation's largest! ), and the distinctive Indianapolis homes of the Meridian Kessler, Butler-Tarkington and Broad Ripple areas. Visit the Indianapolis Zoo Web site, www.indyzoo.com, for operating hours, admission, and more information.